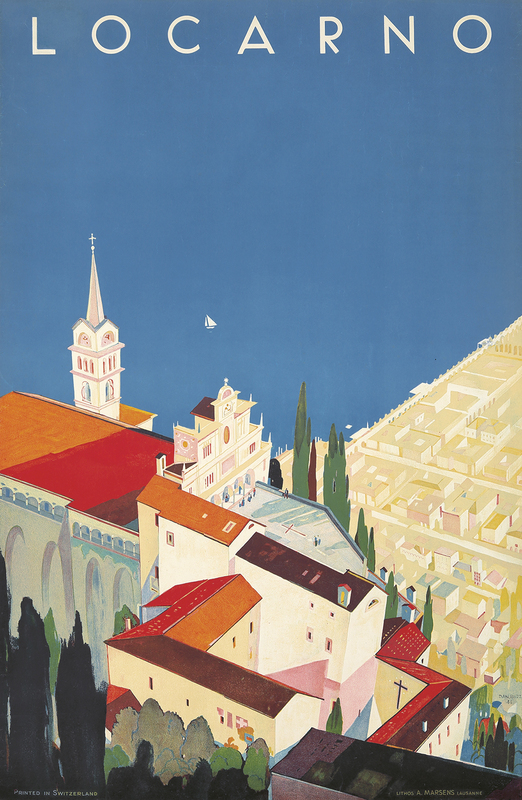 Great Escapes: Vintage Posters to inspire you. You’d think “Great Escapes” are about travel. Ah, but non, monsieurs et mademoiselles. These posters are tales of crafty evasions, lucky misses, and invitations to salvation. Fly past those nets! Juan Manuel Fangio (1911-1995) was the original Speed Racer. Born in Argentina, from childhood he ditched his studies to tinker in automotive mechanics. Then he won five Grand Prix International Championships – a record which stood for 47 years, until Michael Schumacher beat it. He continues to hold the highest winning percentage in Formula One, an astounding 46.15%, winning 24 out of 53 Formula One races he entered. It wasn’t easy. During a long-distance race in Peru, he went off the road and launched himself down a mountainside, killing his co-driver. In 1952, after missing a connecting flight to Italy, he drove all night from Paris to Monza, near Milan, getting to the racetrack a half an hour before the start of the race. Badly fatigued, he crashed on the 2nd lap, breaking (yes, really) his neck. In 1958, at the height of his fame, he was kidnapped in Havana, took up a Stockholm Syndrome, was released after 29 hours and remained a good friend of his captors for years afterward. 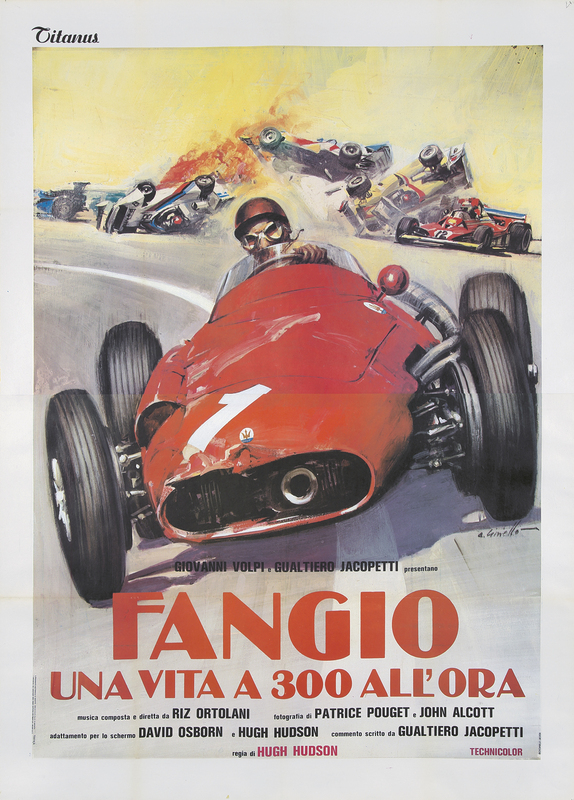 This huge, smashing, crashing, motor-revving, two-sheet offset print poster was created for the film biopic of Fangio. The world champion, in his red Maserati 250F, blasts straight at you, while his competitors smash up in a fiery wreck behind him. San Salvatore, known as the Sugarloaf Mountain of Switzerland, became a pilgrimage destination as early as 1200. Ostensibly, this poster is advertising the new funicular, which would make a pilgrim’s progress much less arduous. However, this beautiful vision of escape and salvation has a double meaning. We’re viewing the mountain from the Italian side of Lake Lugano. In Hemingway’s A Farewell To Arms, the protagonists escape from the World War raging in Italy, by rowing across Lake Lugano to Switzerland in the middle of the night. The poster, printed in 1940, seems to be urging a similar flight for refugees of Italian Fascism. The brochure, perched self-consciously on the ledge, hints at the cover story one should tell the gestapo. 191. Tournèe des Nouveautés/Vous N’Avez Rien A Déclarer. An absurd young man finds himself on a train, without a train ticket. As the conductor approaches, the man’s anxieties ascend to a pitch – at which point he hits upon a plan. The gentleman sitting next to him is a doctor; he wheedles his way into the care of this specialist, as the conductor demands to see tickets. Hilarity ensues. 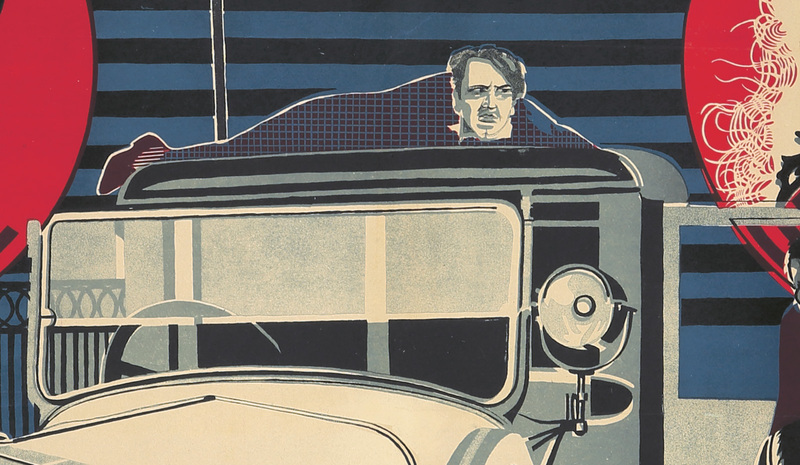 This play, in a touring production, was made into a film twice – once in 1937, and in 1957. 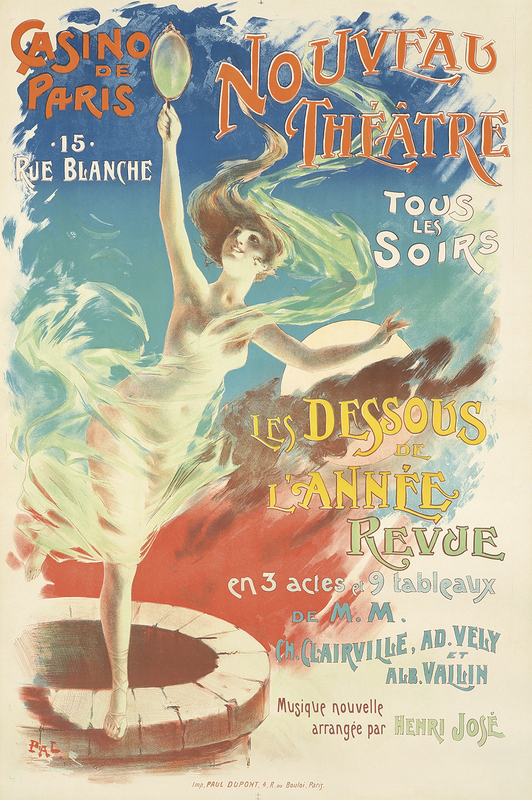 Barrère is best known for his portraits of French stage personalities from around 1900 through 1910. 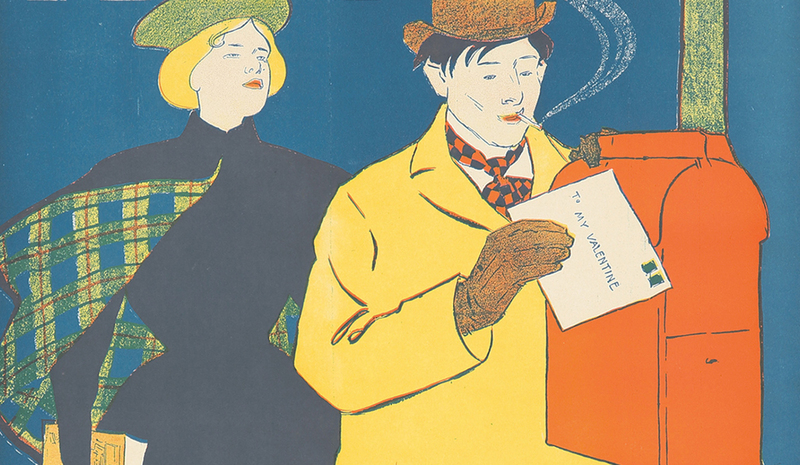 His caricature-like treatments and flat colors yielded witty, spirited designs. In his time, W. T. Benda was as well known as Norman Rockwell, N. C. Wyeth or Maxfield Parrish, and for good reason: his portraiture is immediately compelling, as this example makes clear. 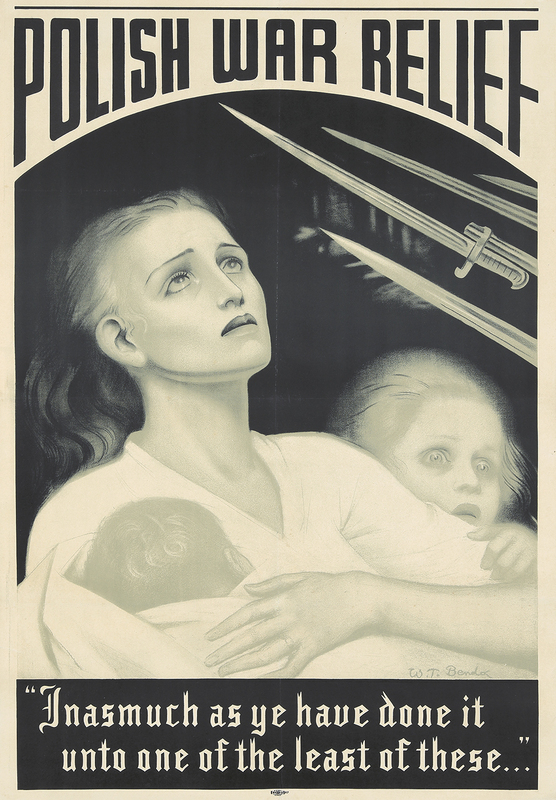 An immigrant from Poland to New York City in 1899, he became closely associated with the Kosciuszko Foundation, and after World War I was honored with the “Polonia Restituta” distinction by the Polish government for his war relief posters like this one. The quotation is from Matthew 25:40. 204. The Black Envelope. ca. 1927. 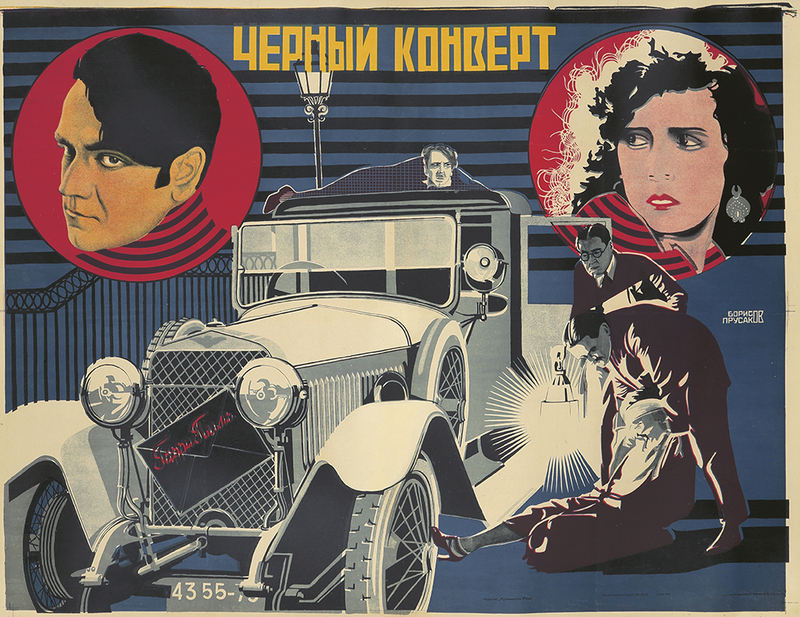 A car, a couple, a clinger-on, a catastrophe: “The Black Envelope,” also known as “The Stigma of Crime.” Borisov & Prusakov were masters of promotion in this trope, the silent pulp film, and they found a like-minded director-accomplice in Harry Piel. “Films pregnant with symbols, shadows, and myths were not for [him]. From the titles downward, they spilled their contents with the blunt finesse of a cheap crime novel or a circus poster” (Cinetecadelfriuli.org). 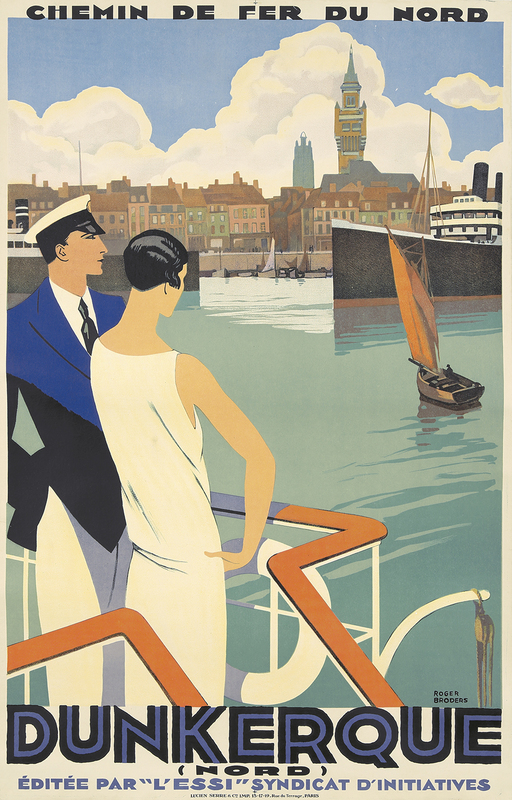 The rarest of all Broders’ posters, this image provides us a view of Dunkerque as it was, before: a charming seaport, with the Bright Young Things on their yacht, watching the steamers and the skiffs sail to and fro. Just 11 years later, Dunkirk would become the scene of the greatest escape in world history: 400,000 British soldiers, saved from annihilation by a volunteer fleet of civilian ships from across the Channel, dramatized in 2017’s epic film by Christopher Nolan. 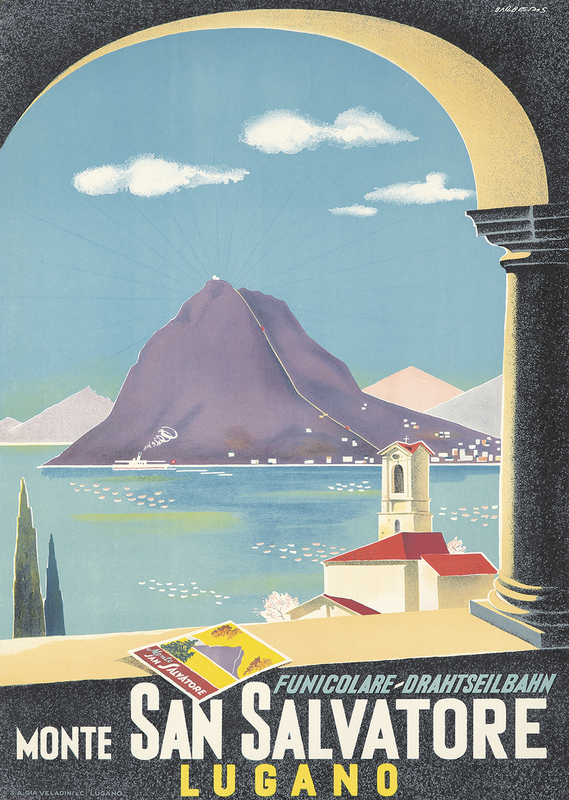 A remarkable travel poster beckoning one to Switzerland, produced in 1944 in the penultimate year of World War II. The vantage point, bird’s-eye above the Franciscan sanctuary and pilgrimage site of Madonna del Sasso, carries the same meaning of escape that we see in Barberis’s poster for San Salvatore (No. 190, above), but with a rectilinear composition reflecting a desire for a return to order. In the upper half, the lone white form of a sailboat appears in the infinite blue of Lake Maggiore, symbolizing the Virgin Mary’s traditional blue and white, and also the endless blue of Heaven. 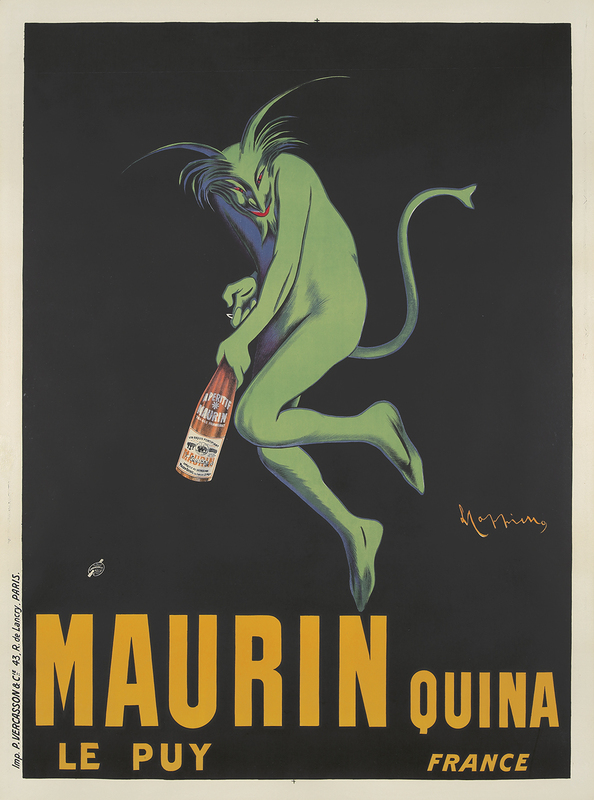 “Free the liqueur!” That’s what the Little Green Devil seems to be expressing in Cappiello’s iconic poster. Ironically, the LGD’s sentiment was pinpoint accurate, though not in the way he (or Cappiello) was expecting. The public turned against absinthe in a huge way. Maurin Quina couldn’t get off the ground; the liqueur ceased production that year. Nothing was left of the drink but the immortal poster. Until quite recently. In the last decade, the poster’s iconic stature convinced liquor producers to rummage through their back catalogue and reconstitute Maurin Quina. You can now find it at specialty liquor shops. The great escape, here, is Maurin Quina’s escape from oblivion – on the back of this magnificent lithograph. Klinger became one of Germany’s most forward-thinking graphic designers in the inter-war years, with an eye for strong geometrical symmetries and small touches of wit. 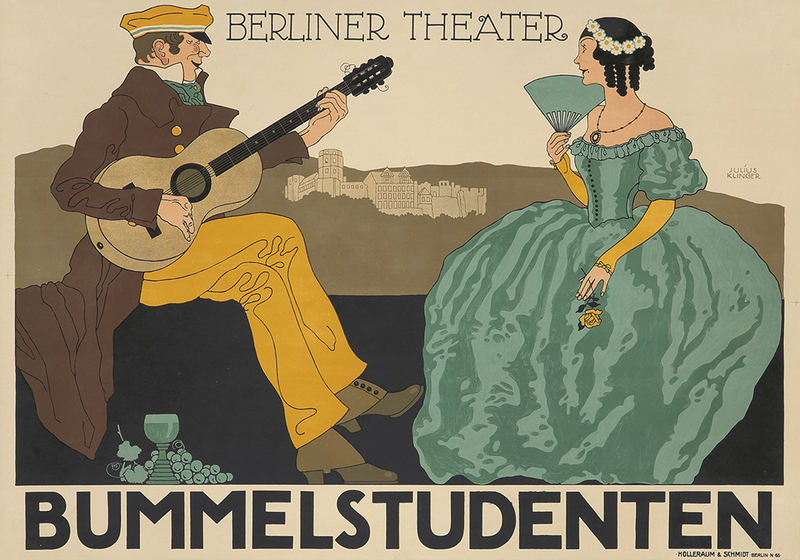 Here’s a Berliner Theater poster for the silent film “Bummelstudenten,” by Rudolf Bernauer, released in 1916. Literal translation: “Student Stroll.” More accurate: “Permanent Student” (!) Equipped with guitar, and fruit and libations at the ready, this superannuated university lad is about to charm himself into the arms of a society girl – escaping from adult responsibilities, and, quite possibly, the Great War itself. Klinger was not so lucky. Though he became one of the most interesting and influential graphic designers in Berlin, the Nazis shut down the Jewish-owned business he worked for. Then, as Klinger was Jewish himself, they “deported” him. He was presumed dead in Minsk in 1942. 396. Casino de Paris / Nouveau Théâtre. ca. 1895. Truth escapes from the well, in order to throw mirror-light on the world! It’s one of the recurring tropes of the French 1890s, derived from an aphorism by Democritus: “Of truth we know nothing, for truth is in a well” (or, less metaphorically, Truth is hidden, dark and deep, and one must dig for it). It was portrayed, in allegorical form, in at least two major paintings of the period (by Gérôme and Debat-Ponsin), and was adapted in several posters as well. 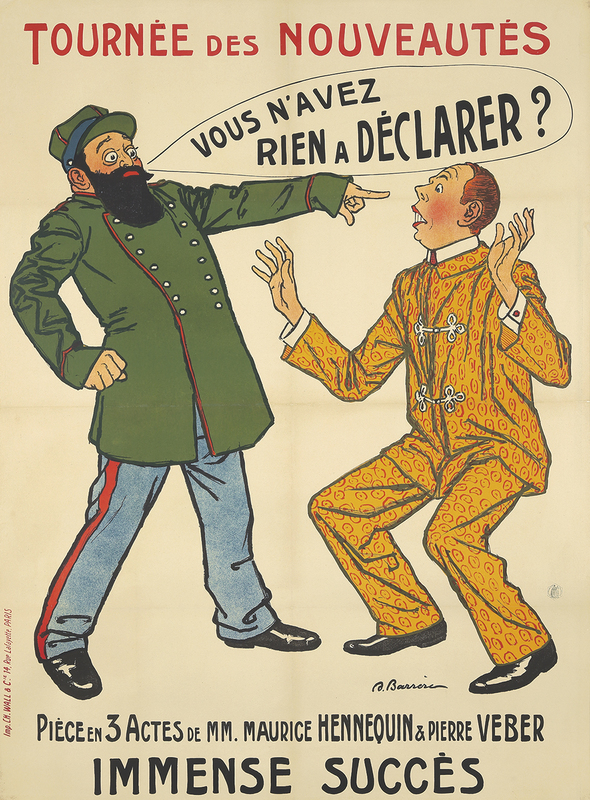 Here, Pal puts a humorous, sardonic spin on the saying for the Casino de Paris’ “Les Dessous de L’Année,” a satirical revue featuring the low-lights of the year gone by. That’s Naked Truth, clambering up with a mirror to show everyone their true faces. Below, the red glow of a fire and its pitch-black smoke rises up, as if to suggest that this is a roast, and everyone will get burned. Given the status of truth these days, we could use a bit more of this. In your face! 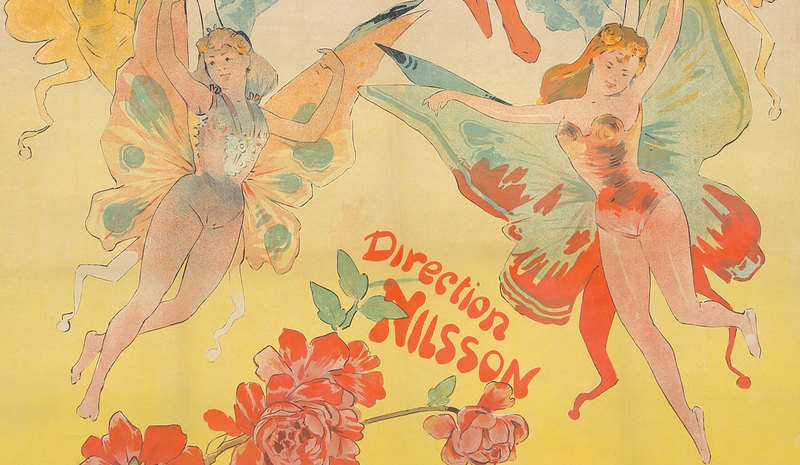 Mademoiselle de l’Affiche thrusts her brush into the nose of a stunned Pierrot in a grand assertion of artistic control. 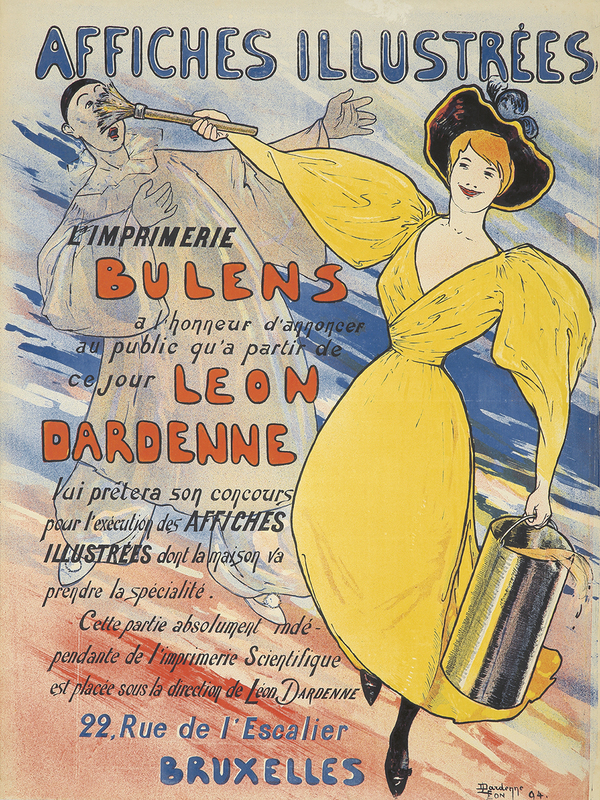 The poster announces that the artist, Leon Dardenne, will now be solely in charge of all posters produced by the Bulens printing firm: an escape from servitude! Sticking it to the Man! An audacious design for its time, and for ours as well.